Home / Grade 10 / Grade 11 / Grade 12 / Physic / Science / Upper Secondary / Development of a Handmade Conductivity Measurement Device for Thin-Film Semiconductor and Its Application to Polypyrrole. 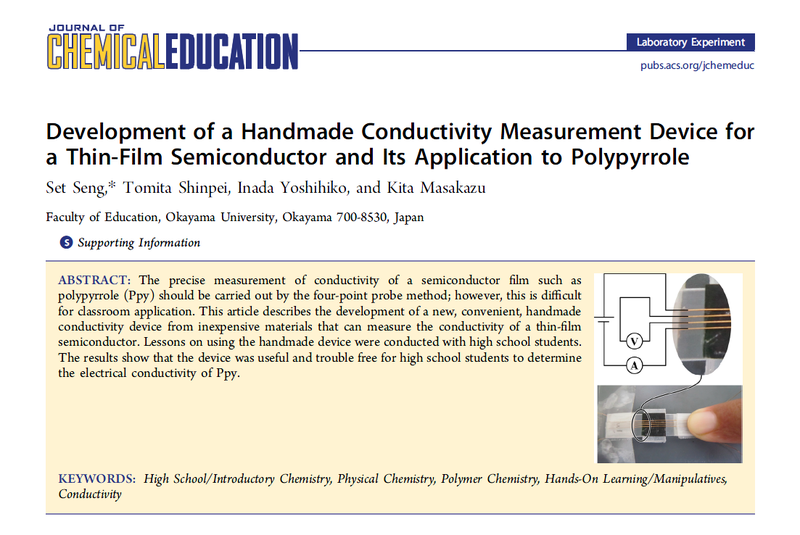 Development of a Handmade Conductivity Measurement Device for Thin-Film Semiconductor and Its Application to Polypyrrole. 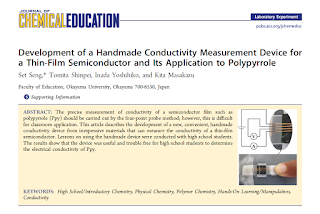 The precise measurement of conductivity of a semiconductor film such as polypyrrole (Ppy) should be carried out by the four-point probe method; however, this is difficult for classroom application. This article describes the development of a new, convenient, handmade conductivity device from inexpensive materials that can measure the conductivity of a thin-film semiconductor. Lessons on using the handmade device were conducted with high school students. The results show that the device was useful and trouble free for high school students to determine the electrical conductivity of Ppy.